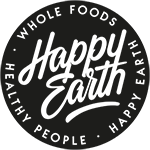 I’d love to know more about The Happy Earth Kitchen! Great! Feel free to follow Happy Earth on FB, Instagram and YouTube as well.